My paternal grandfather’s mother’s maiden name was Corn. Her family, as far as I know, were farmers in southern Ohio. I always like that simple name. Her son, my grandfather, was named Cornie. I’ve never heard the name anywhere else. My name, Coree, sounds like some derivative from my Grandfather, and Great-Grandmother, though no one has ever told me it is so. 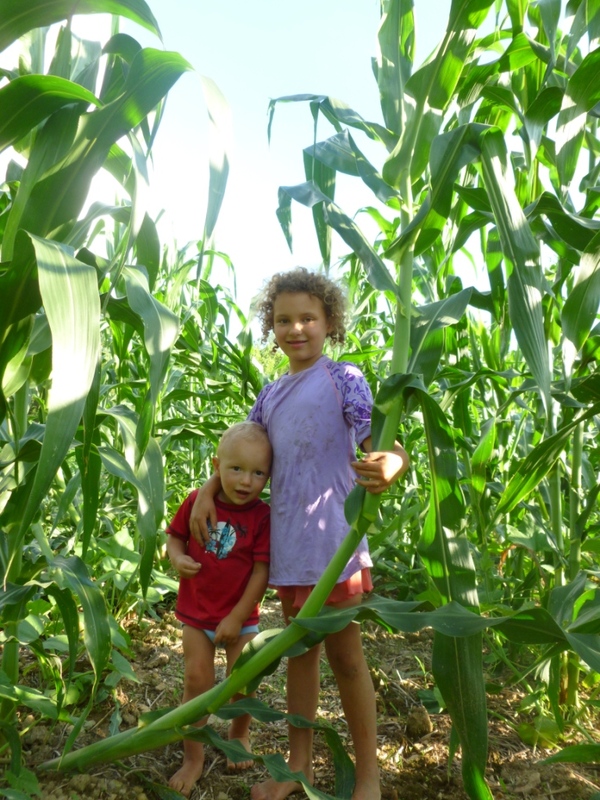 I haven’t passed anything like that along to my children (no Cornelias around here), but they certainly have a love of corn. Who on this continent doesn’t have some kind of of sweet memory around family meals in summertime – slathering butter, salt and pepper, and chowing down on those steamy hot, sweet, messy ears? Lovely stuff, sweet corn. Ah, daydreams of summer. But I’m not talking about sweet corn today. I’m talking about field corn. Grain. 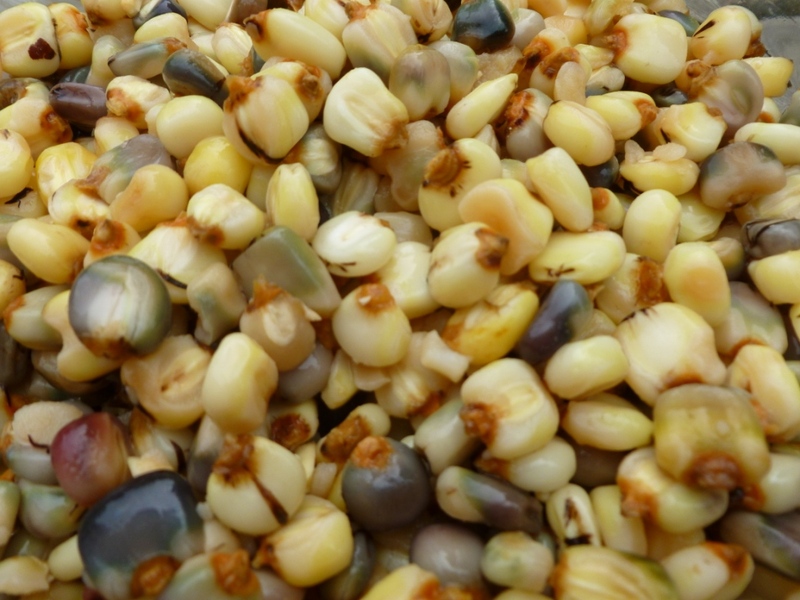 Folks call what we grow Indian Corn, or Rainbow Corn (for good reason), and it is one of thousands of cultivars (as many as 5,000 may exist in Meso-America alone) of open pollinated corn that has been migrating around North and South America for thousands of years. It’s also called Dent corn, which is a cross of Flour and Flint corn. There’s a dent in the top of the kernel (flour corns don’t have that). 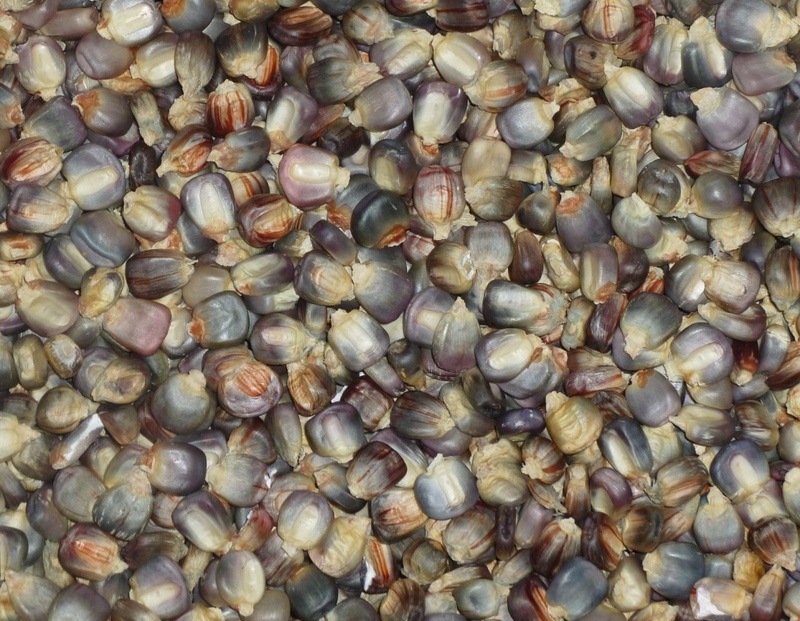 Each landrace, each cultivar, has its own best qualities and traditional use. A-maizing. The variety of corn we grow, called Daymon Morgan’s Kentucky Butcher, came from our friend Susana up in Kentucky. 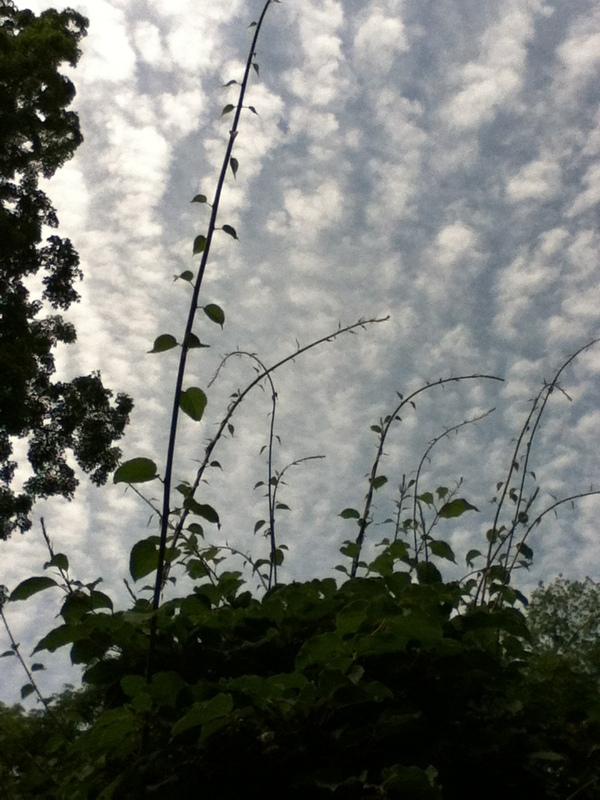 The plants are tremendously tall and vigorous. On a really good year, we sometimes see three ears on a plant. They hold up well in drought (we had a bumper crop last year when almost everything struggled). And the ears are just gorgeous. My meticulous Fellow Man is fond of sorting them by color, admiring the variations of strip and solids, playing with selection for the next season. Each year, as we appreciate the harvest and select the ears we like best, I think that there’s really nothing new under the sun. People have been doing these same things, probably with these same feelings of enjoyment and wonder, for a great long time. Teosinte, corn’s closest wild relative, bears almost no resemblance to modern maize. 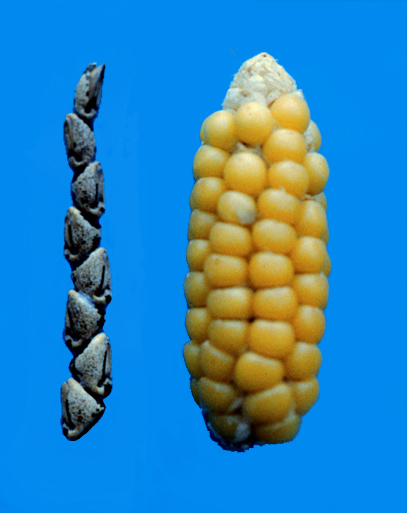 A whole ear of teosinte is less nutritious than one kernel of modern maize. Geneticists have been duking it out for decades over how on earth the Indians orchestrated the transition. Historians have agreed that no matter HOW it was done, it is an accomplishment. “Arguably man’s first, and perhaps his (just as likely hers I think) greatest, feat of genetic engineering.” said Nina V. Federoff, of Penn State University in 2003. And native peoples have abundant fascinating stories about their connection to corn – a very important connection. What doesn’t often get said about the relationship of the people of the Americas and corn is the importance of the nixtamalization process. 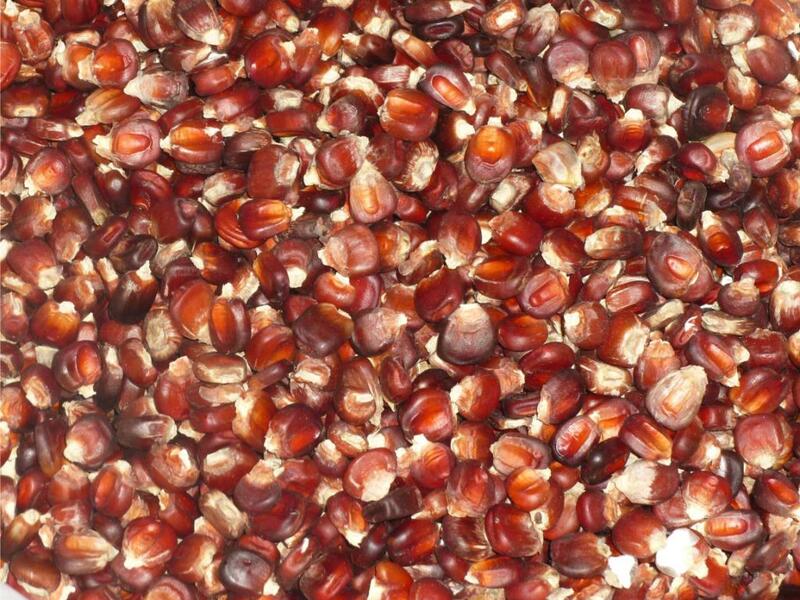 Nixtamalizing corn changes the amino acid profile, making B vitamins and Niacin available and essentially making corn into a complete protein. Nixtamalized corn, along with beans and avocados, formed the dietary basis of the Meso-American civilization, which was at its peak at least if not more technologically and scientifically advanced and populated than any other civilization of its time. Without the nifty nixty process, folks who eat LOTS of corn develop particular deficiencies, such as pellagra (niacin deficiency). Miserable stuff. 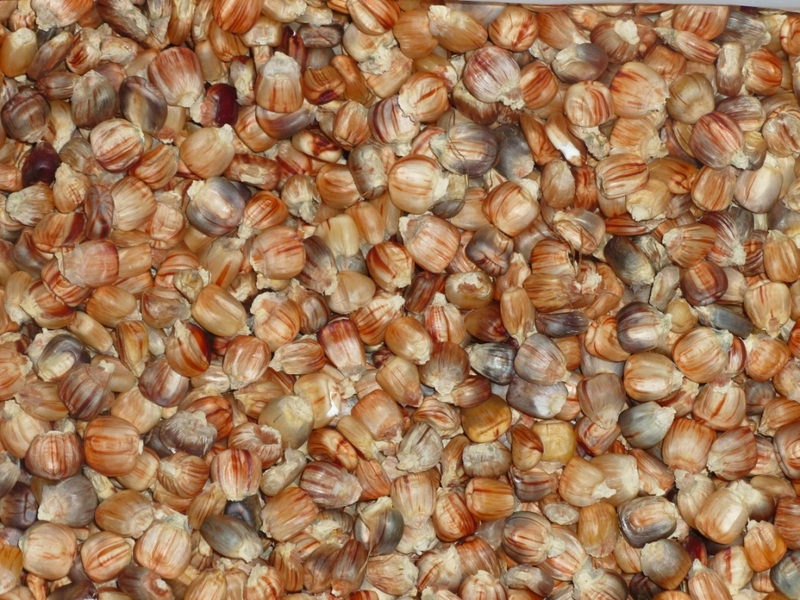 Post-1492, as European explorers exported the wonder-food maize around the world, nixtamalization didn’t often follow them, and the results were evident. Don’t get me wrong. I LOVE cornbread, but it turns out the Daymon Morgan kernels are so large that they don’t easily grind in our Nutrimill grinder. So, to make cornmeal, we have to crack the corn in a simple hand grinder, then baby sit it to make the small pieces pass through the electric mill. 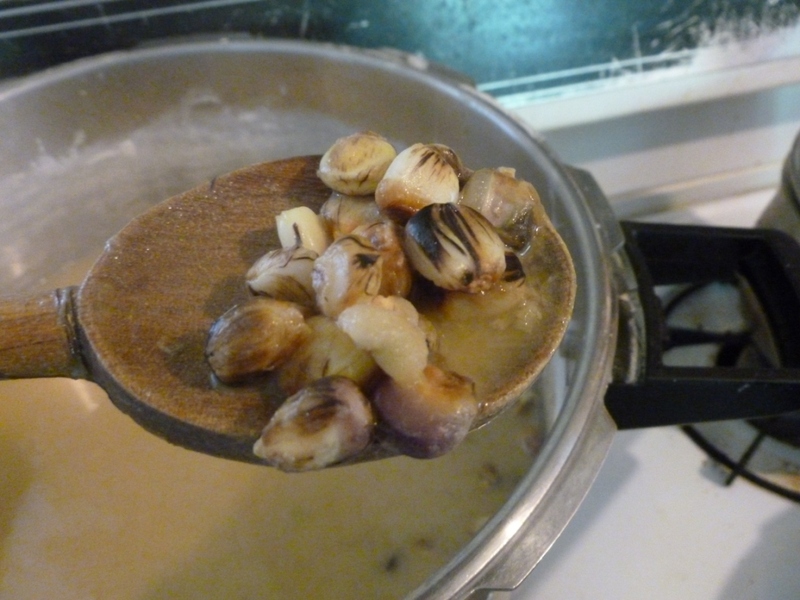 Nixtamalization has given me a good, no, GREAT, way to work with our corn whole. And even better, nixtamal takes corn to another level. I instinctively want to eat a lot of it. The kids feel the same way, and they munch it down as soon as it comes from the pan. Can’t beat that! 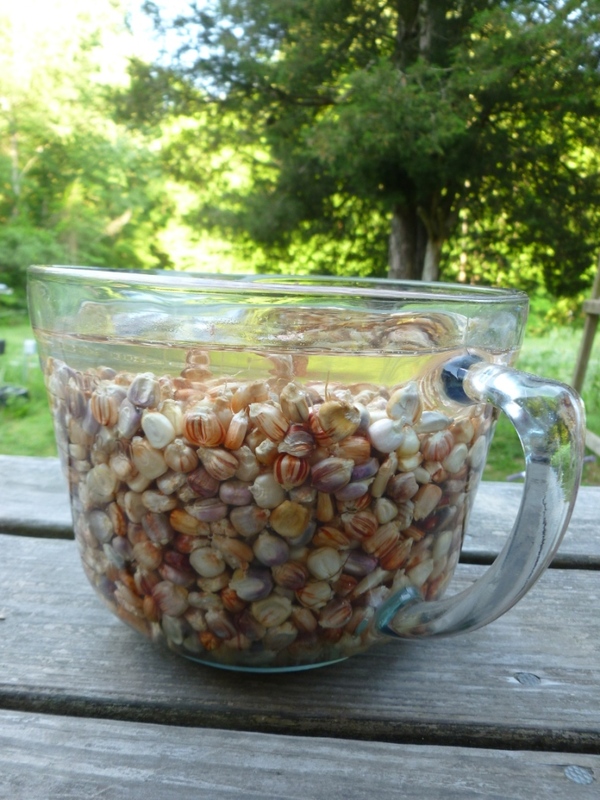 Take one pound of field corn, preferably from your own garden, or a grower you know, and soak it in lots of water overnight. Drain the water, put the corn in a pot, and add fresh water in abundance (2 to 1, water to corn). Add either ½ cup sifted untreated hardwood ash (if you have it), or 2 Tablespoons pickling lime. Bring the mixture to a boil and cook it for a long time. Our friend Sandor says three hours – stirring from time to time. The skins will begin to loosen. 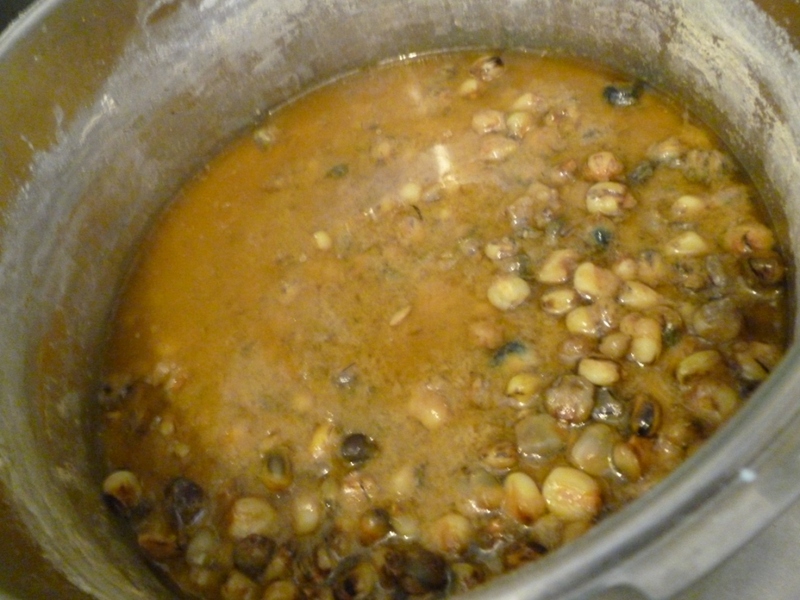 When they begin to slough off, remove the pot from heat and begin to rinse. The whole mix will look really gross now, but smell nice. Rinsing is a water intensive process. Run water through the pot until all the little skin particles and gross cloudy liquid is gone. 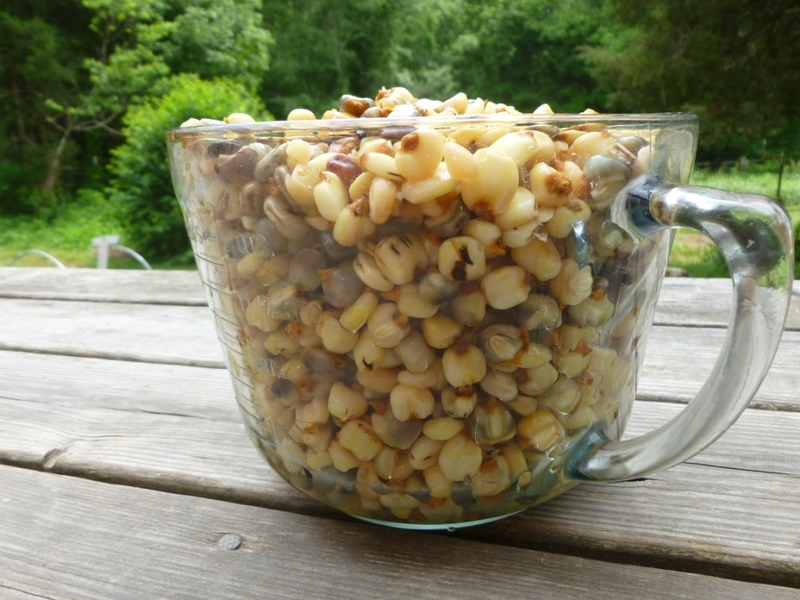 As soon as the water is cool enough, plunge your hands in there and squeeze and scrub the kernels to help them along. The rinse water should come clear. The kernels should be chewy soft. This maize is hominy. It can be eaten just as it is, sauteed in butter as a chewy grain (nice with eggs). I’ve ground it in a food processor and made good little corn cakes from it. We’ve also dried it in a warm oven and ground it into masa. I’ve not perfected my masa tortilla process yet, but thoroughly enjoy tortillas with half and half flour and masa meal. There are thousands of years worth of recipes to explore. Nixtamalized maize is also the foundation for many corn ferments. I won’t comment on them now because I haven’t explored that realm yet, but it’s definitely the direction I’m going. I’ve taken these nixtamalizing directions loosely from Sandor Katz and his excellent books. Please look at them for more great ideas. I’m particularly looking forward to playing with fermented nixtamal and cocoa. 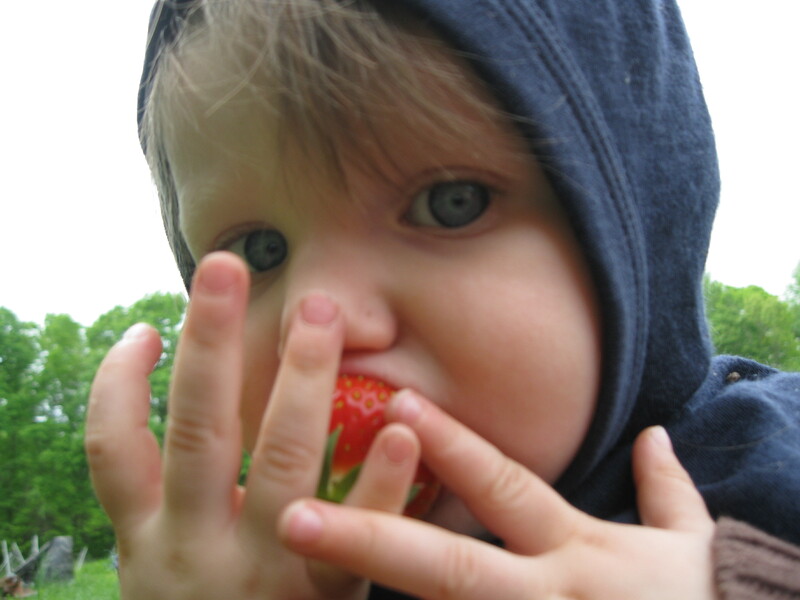 I have purposefully restrained myself from discussing genetic modification in this post. Maybe some other day. For now, suffice to say that thousands of years of skilled observation and care have created maize, and so many other important foods. It’s perfectly possible for that good work to continue without the help of gene-splicing agri-scientists/businessmen. Please support growers who use non-genetically modified crops. Eat more corn. Vote with your plate. If you would like to grow some of our Daymon Morgan seed (we’ve been saving it for about 6 years now), we will gladly sell you some. Contact us. this project has a deadline approaching much more rapidly than i care to admit. so on this sunny mid week i am thankful for the sound of drills, the beauty of channel lock and plans for the purlins and end wall framing tomorrow morning. 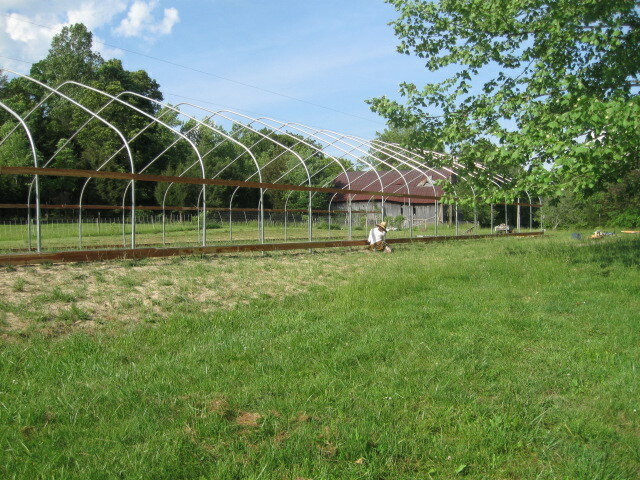 high tunnel number two is definitely in a race for the finish. While running an errand recently (in a vehicle with a functioning radio! ), I caught the tail end of an On Point interview with Willie Nelson. Something he said really stuck in my mind: “There’s a lot of roads that lead to the same place.” In the interview, he was answering a question about his spiritual life but that simple and profound statement could be applied to so many areas of our lives. It’s a statement worth considering. In my own personal life, I give considerate amounts of thought to food. I am a farmer, after all. 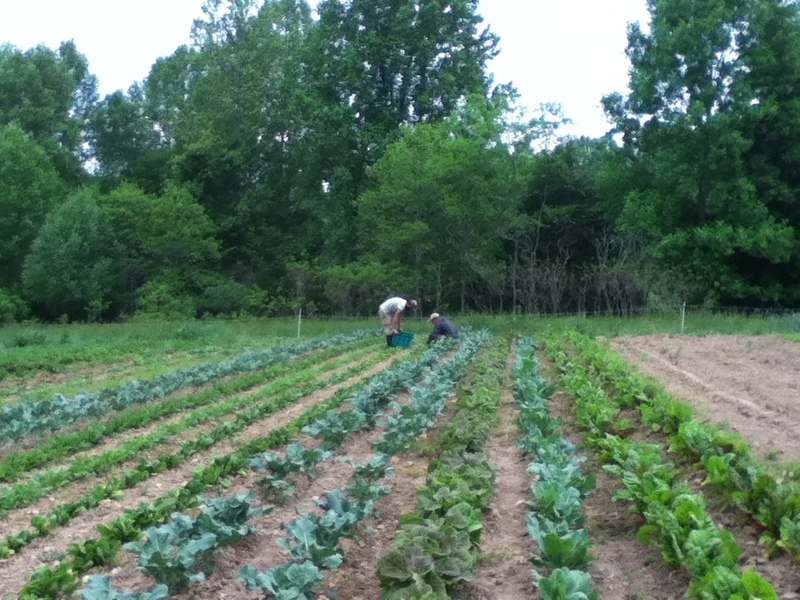 I grow food to feed myself, my family, and other families. And I’m a mama that prepares a heck of a lot of meals and snacks each and every day for my beloved little ones. 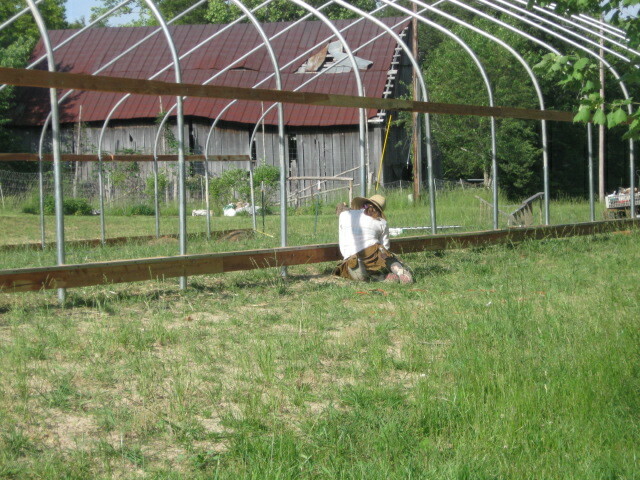 I came to this agrarian lifestyle by choice. Not only was I hoping to live a simple, sustainable life, I also wanted to live a healthful life. Eric and I each had a parent die from cancer when we were in our teens. (We didn’t know one another yet, but my father and his mother died just a few weeks apart.) At the time, I didn’t have a clue about the restorative, regenerative qualities of nutrient-dense food. Had I known then what I know now, however, I often wonder if I could have helped change the course of my father’s cancer. It’s difficult to think about. My views on what I consider healthful have changed (maybe I should say evolved) a bit over the years. One road I chose for awhile was that of the vegetarian. Primarily because I was not growing or raising my own food at that time, and commercially available meat seemed the most susceptible to improper stewarding practices, I just opted out of eating it. I didn’t consider the impact that the growing of all the soybeans I was consuming for non-animal protein (in the form of soy milk) might have on the environment, and on my own health for that matter. It wasn’t until I started trying to raise a family of my own that I realized something was up. My very active, very physically fit twenty-something year-old body couldn’t maintain a pregnancy. I thought my diet and eating habits were pretty good, as well. My body was clearly telling me otherwise. I had no idea that soy products contain phyto-estrogens, and that as an infant fed soy-based formula, I would be particularly sensitive to excess estrogen in my diet. My hormones were just whacked out. 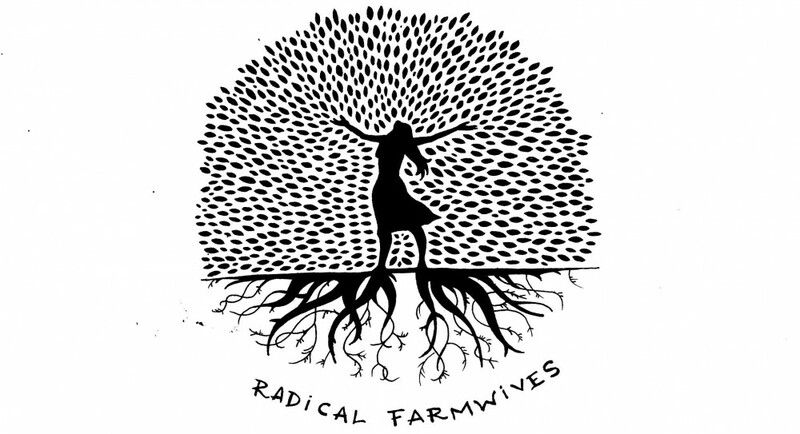 After a few years of struggle, Eric and I stumbled upon the work of Sally Fallon, and her amazing book Nourishing Traditions. What an eye opener for me. The road I was traveling took a sharp turn. By the time of this discovery, we were raising bigger and bigger gardens to grow more of our own food. 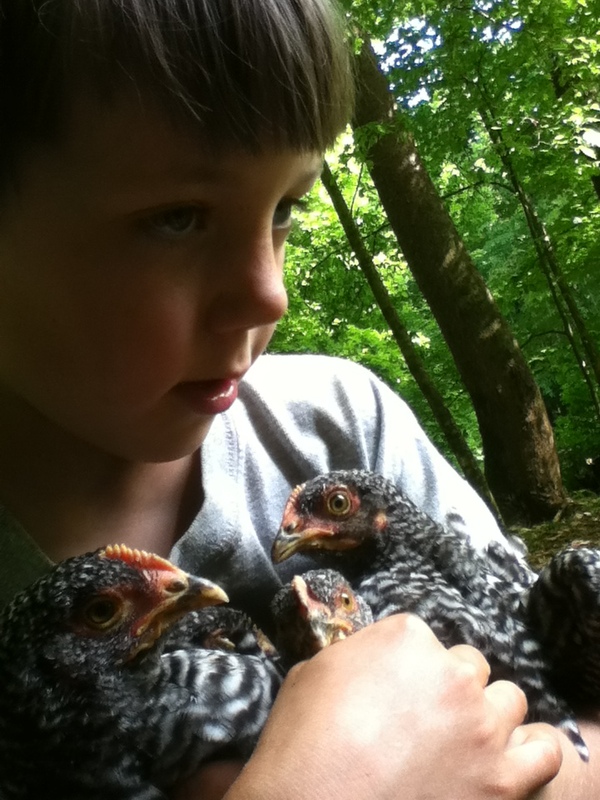 We also decided to raise a batch of chicks to increase the size of our tiny flock. As nature dictates, half of those chicks were roosters. What on earth were we going to do with all of those tenderly raised roosters? Well, the responsible thing… we were going to eat them. So my road led me back to a diet that included much more in the way of animal products. And if not for continued searching and reflection about diet and health, I don’t think my sweet family would exist today. As you can imagine, I’m pretty pleased that they do. Life gives life. In order for one thing to live, something else must die to feed that life. There is really no way around this. Be it a head of lettuce or a hamburger, an egg or a nut: something that was alive or containing the potential for life is transformed into more life energy by something else. Reflecting on what Willie said I really do see that there are a lot of roads that lead to the same place. And when I relate that statement to my obsession with high-quality food and conscious eating, my conclusion is this: We all live. We all breathe. We all eat. We will all die. This evolving, revolving world is laden with choices. Let us use our keen insight to make the most thoughtful choices that we can. Let us shake off any complacency regarding food and seek answers to our questions. And let us respectfully educate each other so that every living being on this verdant earth is granted the opportunity to flourish. As humans, we share these roads. If I see you have a flat tire along the way, I will stop to lend a hand. I hope you will do the same for me.